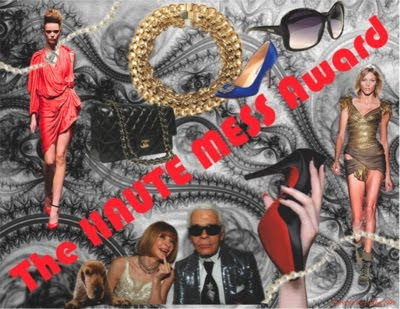 Lovely Kelsey of The Anthology has given me the Haute Mess Award. Thanks Kelsey! It's been a weekend of rest and relaxation for me as I try to take it easy: a pub crawl on Friday night, roast chicken dinner and seeing Ninja Assassin on Saturday night, and sleeping in and watching Pushing Daisies on DVD on Sunday. How was your weekend? Congrats darling Lisa, and thank you so much for honoring me! ooOO did you like ninja assassin? AliciaFashionista, Ninja Assassin was exactly what I expected, a brainless ketchup factory blood fest of a movie. But it was pretty entertaining. Congratulations on your haute mess, dear. :) That sonded weird. Congrats! Your blog is always fun to stop by. VFW show reviews coming soon!